Where Can I Get a Speed Graphic? There is a tendency for the name ``Speed Graphic'' to be used to denote any ``press'' style camera. The Speed Graphic was manufactured by Graflex, a Rochester, New York based camera producer. It was the dominant portable professional camera from the 1930's through the end of the 1950's. The Speed Graphics and their brethren, the Crown Graphic and Century Graphic are remarkable cameras capable of the highest quality of work. The Speed Graphic has not been manufactured since 1973 and most photographers today are unable to make a direct comparison. In many ways, the Speed Graphic was America's first and last great camera. After the war, I bought a Pacemaker Speed Graphic and started a commercial and portrait studio. With the Speed Graphic, a 4x5 Super-D Graflex, one reflector flood light, one background light and a primitive darkroom, I became a commercial photographer. The Speed Graphic camera has two shutters - focal plane and in-lens; three viewfinders - optical, wire frame and ground glass; interchangeable lenses; a rise and fall front; lateral shifts; a coupled rangefinder; and a double extension bellows adaptable to lenses from 90mm to over 300mm. The Speed Graphic looks complicated, but is one of the simplest and most flexible cameras made. Afflicted by a ``Rube Goldberg'' variety of features - three viewfinders! - you prove your skill everytime you use it. Nothing in the Graphic is automated; if you don't pay attention you can double expose, shoot blanks, fog previous exposures or shoot out of focus images. However, once you get used to it, it is amazingly easy to use. The older Graflex SLR with its patented focal plane shutter and reflex focusing had been so successful as a press camera that the Graflex company set out to design a camera specifically for the emerging ``press'' photographer. The result was the original Speed Graphic of 1912. The concept of having two separate shutters was a new idea. The focal plane shutter was the same as used in the Graflex, the front in-lens shutter provided extra versatility. Because both shutters cannot be used at the same time, there is possibility of confusion. Experienced Speed Graphic users find selection of shutters second nature. In 1940, Graflex announced the Anniversary Speed Graphic with Kodak Anastigmat (or the then all-new Ektar) lens. 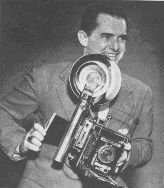 The new features included the coupled rangefinder and flash solenoid to use the then popular flashbulb. The bed would drop past horizontal, allowing the use of the new wide angle lenses. If you are puzzled about the kind of camera to buy, get a Speed Graphic... for two reasons... it is a good camera, and moreover... with a camera like that the cops will assume that you belong on the scene and will let you get behind police lines. In 1947, the Pacemaker Speed Graphic was introduced bristling with new features such as a body mounted shutter release and simplified focal plane shutter, now with 6 direct-reading normal speeds rather than the 24 tension/shutter combinations possible before. The Graflok back, with a metal focusing hood and removable ground glass was introduced in 1949. The Graflok back is now the standard for 4x5" view cameras today. The Graflok back accepts sheet film holders, "Grafmatic'' 4x5 sheet film magazines, 120 roll film adaptors, Polaroid backs, the Kodak ReadyLoad and Fuji QuickLoad backs, and the now-obsolete film pack. The Speed Graphic, like other "press" cameras, is designed to be operated either handheld or on a tripod. In this sense, there is a kinship between the Speed Graphic and 35mm gear. In the larger format world ``kinship to 35mm'' cannot be considered equivalence of features or toys. The 4x5" Speed Graphic could not be farther from modern 35mm gear in terms of construction or configuration. Yet with a Grafmatic one can shoot six successive images handheld using shutter speeds as high as 1/1000 sec. The Graflex company name changed several times over the years as it was absorbed and then released by the Kodak empire, finally becoming a division of the Singer Corporation and then dissolved in 1973, when Graflex corporate history ends. The award-winning Graflex plant in suburban Pittsford, New York is still standing and is home to the MOSCOM Corporation. Post-1940 Graphic cameras may be considered usable cameras, rather than antique or collectible cameras. The Speed Graphic was manufactured in a number of sizes, 4x5" being the most common, but also in 2.25x3.25" 3.25x4.25" and 5x7". There is some confusion about the spelling of company and camera names. The company name is "Graflex", and the camera is a "Graphic." A "Graflex" camera is a reflex camera with a chimney-style finder. The hybrid "Graphlex" is a misspellign, as are the following misspellings for "Graflok": "Graphloc" "Graphlock", and "Grafloc." This paragraph is here mostly for people searching for those misspellings.